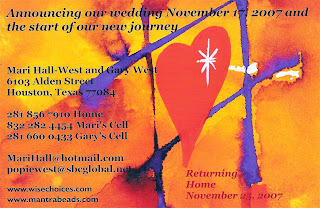 In just a week Gary and I will be leaving for our wedding trip. We will drive from Houston to Nashville, TN and then on to Gatlinburg TN the next day. Our family will start arriving on the 15th of November for our wedding on the 17th. Afterwards we will be spending Thanksgiving with part of our family in Townsend, TN before driving back to Houston on the 25th, to arrive on the 26th. We are so thrilled that we will be in the mountains in the fall. Hopefully the fall splendor will still be bright and colorful for our special day. I will post a newsletter with some photos once we are back and settled in. The Usui Rereat will start on December 21st. I will write more about that later. Have a beautiful month of November. This is the time to celebrate and enjoy the harvest with family and friends. We have so much to be grateful for. Thank you for being in my life. I hold you all in my heart.